With today’s modern homes, short driveways are a common sight, meaning there is often less space to park a car in front of a garage. In such instances, choosing a garage door which makes efficient use of that driveway space becomes even more important. Garador’s sectional garage doors are recognised nationally for their superb precision engineering, security and reliability; meaning the door will continue to work year after year. A sectional garage door is constructed from sections which rise vertically and run on tracks back into the garage. It is therefore a perfect choice for short driveways, as it allows for much closer parking to the garage door. 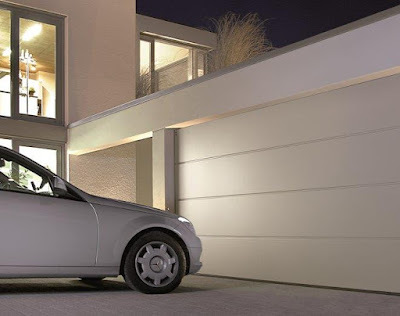 Finding a garage door that is functional and suitable for a property design isn’t the only consideration for specifiers, builders and homeowners; they will want the garage door to look the part and make sure it is in-keeping with the style of the property too. Garador’s Sectional doors come is a wide variety of designs, including panelled versions like the elegant Georgian style and the linear small, medium and large styles. In addition, there are numerous variations of surface textures like silkgrain, sandgrain, woodgrain and timber effects with a real woodgrain quality to the surface texture. So it’s not surprising these doors continue to grow in popularity, as there is just so much to choose from.